Previously, Only Stories Can Be Viewed. There Is No Option To Share With Friends. Thanks! 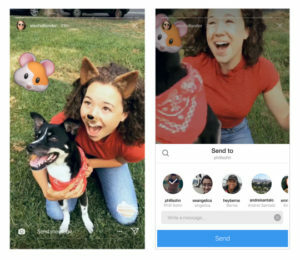 To Instagram For Adding Ability To Send Stories Via Direct To Friends. Sharing A Story Via Direct Is Very Easy, Simply Go To Instagram Home, Tap On Your Friend’s Story Rounded Icon. You’ll See The Direct Icon(Aeroplane Type), Click On The Direct Icon, Select Friends To Share Story. You Can Also Add Message As A Caption Alongwith Sharing Story. When Someone Share A Story With You, You’ll See It In Your Direct Inbox. This Message Will Be Appear In Your Thread Until Story Alive. Once Original Story Disappears From The App, It Will No Longer Available In Message Thread. By Default, This Feature Will Be Enable. But If You Don’t Want Let Others Share Your Stories With Their Friends, Then You Can Turn Off The Ability For Others To Share Your Instagram Story In Direct. Go To Your Profile Tab-Click On Options(Three Dots At Top), Go To Story Settings Under Menu. And Disable The Ability For Others To Share Your Story. If You Have A Privat Account, Then Only Your Followers Can View Your Story In Direct. This Update Will Be Available On Android, Update The App From Google Play Store, On iOS-Update It From Apple App Store. This Update Is The Part Of 11.0 Version. Since launching last year, Instagram Stories has quickly become a place to connect more closely with the people, interests and brands you care about most. Now sharing those favorite everyday moments is even easier.